Was designed to be of the highest quality at any price range (see features below). This valve is the best value possible in a boost controller. or buying someone elses "hardware store" or home made product. Sealing and durability is as good or better as ANY valve even high priced ones. There is nothing to rust over time,and the valve seat has a ground finish. Used to raise the and set the boost level on ALL turbocharged engines. User takes all responsibility for the use of this product. This is for ONE boost valve with two straight fittings that fit 3/16" (4mm ) Inside diameter hose,no mounting screws included. OR you can specify 1/4" straight fittings for the same price. We show 4 other valves with different fitting combinations in the picture, only so you can see the other fitting combinations. Contact us if you would like different fittings with your valve. 90 degree SWIVEL 3/16", this one costs more but you can turn it to any direction. We got tired of cheap or overpriced boost valves that did not last, or did not gate properly….so we designed our own!! We made it so the barbs are parallel instead of having sloppy hose routing that happens with 90 degree designs. This is a clean no bling minimalist design with quality design,construction and materials. GATED valve for fastest turbo spool up possible with your set-up . Many of the cheaper multicolored silver knob type valves are just a needle valve which bleeds boost (slow spool). This valve is gated which means it does not open until just before the desired boost level is reached, this keeps the waste gate from creeping open to provide fastest spool. Some low quality boost controllers have a needle valve and then an "afterthought" gated "T" fitting, these are less clean of an installation AND the gate is not adjustable, it is just set at a low level ,this does not get you the fastest spool for your boost set point. Our gate automatically adjusts when the main boost level is adjusted for quickest spool up. Configurable plumbing! For NEAT hose routing. Nickel plated brass fittings standard specify 3/16 or 1/4"
ALL parts are corrosion resistant other valves us spring steel (not stainless) and just chrome plated balls that rust over time. 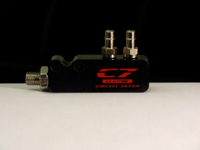 Billet Aluminum body (not pot metal like the cheaper ones), Black anodized. Stainless adjustment shaft , other valves use black oxide shafts that rust over time! Lock ring ...it will never loose adjustment. Coined (for seat hardness and shape) AND 6 micron diamond honed seat for best sealing and long life) Most valves only have a rough machined seat, WE do two extra machining operations. We use a Borosilicate valve element because it is harder,smoother (best seal) and does not corrode. It is also lighter than steel or stainless steel . Lighter means the spring & seat last forever AND the response is extremely fast. OH my , it even has mounting holes!!! And we sized the hole so you can tap in 10-32 if you want.Pre drilled to correct size for tap, just run the tap through it. Or you can use it as a through hole for #6 screws. Basically we are selling a higher quality valve for less, both in terms of design AND materials !!! Orders are normally received by our customers in 2-3 days. 30 day warranty on items returned in non-abused condition. Item must be cosmetically perfect in order to be returned. 15% handling fee on returned items.